On Monday in our town you could hear a mixture of moms crying about sending their babies off to school and the other half were celebrating and shouting, "WAHOO!". School was officially back in session! We had backpacks packed, lunches made, clothes laid out, and were ready for the first day. These two were excited about getting back to school, seeing their old friends, and getting to know their teachers. Ebby Lee is in second grade. 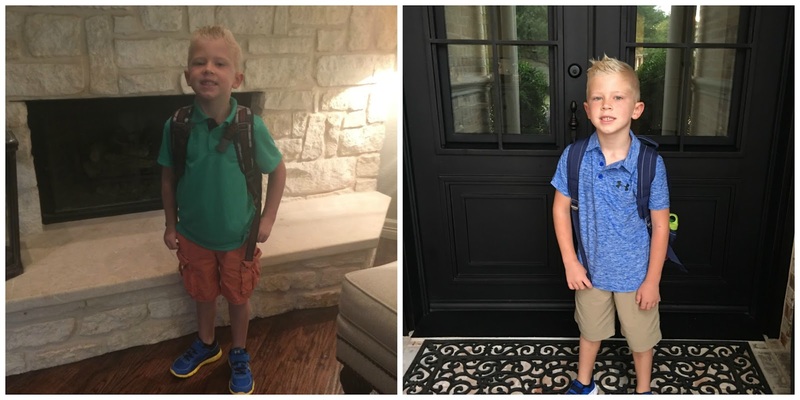 Nixon is in first grade, and Bowen will head back to preschool a couple days a week soon. Apparently we love a denim vest on the first day. :) Mamas out there with girls who own a lot of strappy dresses. It's the best way to make those dresses school appropriate. My tip for today. And Nixon's first day look seems to be sponsored by Under Armour. Nixon on his walk into first grade. He has such a fun, big personality but he's a home body and prefers to be with us or grown-ups he knows well. He was a little nervous, but is loving his teacher! Off to a great start! After drop off, Bowen and I headed straight to breakfast to meet some other friends/mamas. And because apparently, I'm into the side-by-sides today. Bowen and Ashby last year versus this year. I enjoyed my breakfast and catching up with these ladies. The first day did include them arriving to these HOMEMADE chocolate chip cookies. I think that was my FIRST time to ever make homemade cookies. I'm not even kidding. They morphed into a big pile, but tasted delicious so we didn't mind one bit. Our booth was the wild one! We ended the night with showers, a book, and lots of first day stories. Day two this was the scene....balloons, streamers, and pinwheels! I ran into the store to grab some balloons and they had four inflated balloons-You Rock, Congrats, Get Well, and something super baby-I can't remember. So I grabbed the other three and we decorated. When Ebby Lee saw them she said, "Why does one balloon say, 'Get Well'?". I explained the situation and told her since Bowen can't read that's his. She thought it was HILARIOUS! And because the second day of school needs a silly string fight-we HAD one! Our neighbors stopped by and we all got in on the action. Ebby Lee and I had the same first day of school dress on ;) Cracking up about the balloons, girl. Way to improvise!!! I love the side by side photos. It's amazing how much they grow in a year. The balloons made me laugh out loud! My husband is a lawncare guy so I'm sure he would be the same ab the silly string but the pictures show how much fun they had so it was worth it! I don't know what is funnier, the fact that you forgot to decorate the door or the Get Well balloon? I seriously was laughing out loud! Hahahaha! Good job, mama! That silly string fight is adorable!! The kids looked precious on the first day! Hope they have a great first week! That silly string fight looks like so much fun!!! LOVE your new doors, too. They are gorgeous! That's awesome! Great minds. ;). I did the best I could with those balloons. Haha! I cannot believe Tab hasn't noticed. I am shocked!! It was and thank you!!! Ha! DJ would freak if we did silly string! 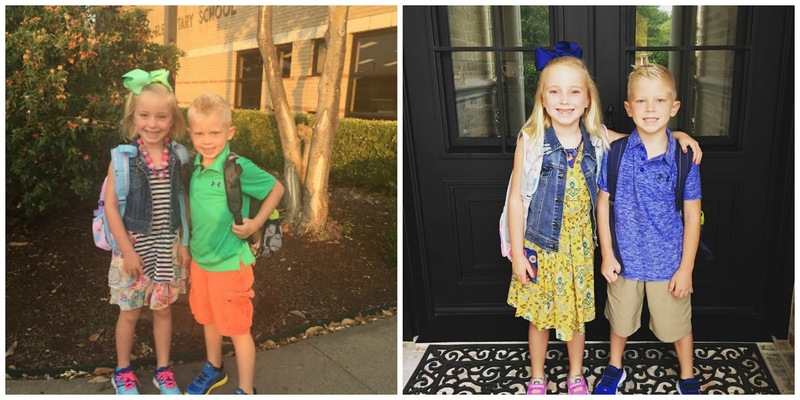 glad they had a great first day! Laughing so hard at the Get Well Balloon!!!! Carter picked out a birthday card for a friend earlier this week, and he got a GET WELL card because there was a picture of a dog drinking from a toilet (it said "drink more fluids to feel better") and Carter thought it was hysterical! :) And side by side pictures get me every time! So fun! I'm so glad you posted about forgetting to decorate the door on the first day and the get well balloon. I read a lot of blogs and the writers seem to do everything perfectly. 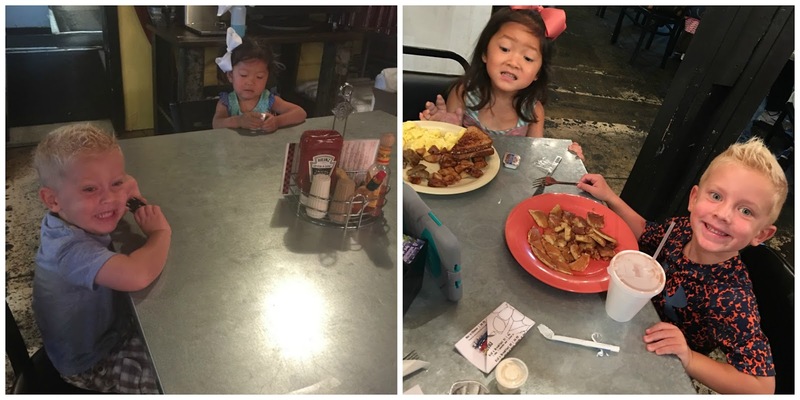 It's refreshing to see a post written by a Mom who will show the reality of everyday life. Thank you! I love you for keeping it real. . That balloon. . Hey you at least came up with something that's a bit in my book lol!!! Lots of smiles for the first day! Love the new front door! Way to keep it real...and fun! Good job! You are hilarious! I love how you just go with the flow. And you're teaching your kids to be easy-going too. Way to go. I put too much pressure on myself to do everything just right & I'm starting to see that being passed down to my son. Thanks for reminding us to just do the best we can, girl. I wanted to let you know that Batiste dry shampoo is $4.99 at TJ Maxx and Morrocan large bottles of shampoo are $9.99. There are other morrocan products there also for way cheaper. Love the silly string fight!!!! And how is Ebby Lee in second grade!?! Seems like she just started school. I spy a helmet baby! My son had one too so I'm partial to them :-) And your get well balloon is cracking me up!